Hannabery HVAC is a Trane Comfort Specialist Contractor - For Comfort You Can Count On! A Trane Comfort Specialist is an independent Trane dealer of the highest standing in every aspect of their business! 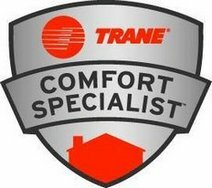 Trane Comfort Specialist means the independent Trane dealer is committed to being the best in installation, service, customer satisfaction and employee training. Not every dealer qualifies as a Trane Comfort Specialist, but rather only those that meet Trane’s stringent standards and who demonstrate a commitment to customer satisfaction and continuing education. These dealers are committed to training to keep up to date with Trane’s latest technology, ensuring that you receive a system that is designed to achieve maximum efficiency, reliability and comfort, as well as a system that delivers the efficiency its ratings promise and that you expect. Many Trane Comfort Specialist dealers have NATE certified technicians, which Hannabery HVAC does. Organizations that are part of the NATE coalition include the U.S. Environmental Protection Agency and American Society of Heating, Refrigeration and Air-Conditioning Engineers. ALLENTOWN, PA. — Local business Hannabery HVAC received the Top Sales Volume Award for 2013 from Lyon Conklin & Co. Inc.
Zack Nicolai, owner of Hannabery HVAC, accepted the award from Tim Gilbride, general manager for Lyon Conklin, Mike Ziska, Sales Manager, and Jim Robbins, the district representative for Trane. "We are very happy with the growth we've had in 2013. We value our customers and as an independent, locally and family-owned company we strive to deliver quality installations, the best name brands, and customer friendly service with fair and reasonable prices," said Service Manager Mike Smith.